Already known in the industry as Europe’s No. 1 salon brand, Wella are famous for their incredible collections of high performance haircare products, and with good reason. I often recommend them to people asking me what to use on their hair, especially due to the fact that their range is so vast and easily customized. I often get the reply that it’s a little pricey though (for us beauty freaks, money is no object! ), but now Wella’s expertise is available at a supermarket near you, and their new collection is an absolute steal! The new collection has been designed to meet the changing needs of women, with a range of products inspired in salon, using trusted technologies in a compact line-up. 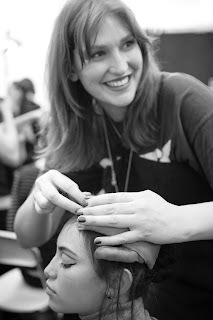 My own stylist, the fabulously clever and damn nice Lauren Gunn (pictured), Creative Director of prestigious Auckland hair salon Stephen Marr, has also been named the Wella Pro Series New Zealand Ambassador, a role not given lightly. With its sleek, red packaging, Wella Pro Series gives you all the professional care of the salon range in an easily accessible collection for use at home. The shampoos and conditioners also come with pump dispensers, just like the salon bottles, so you can monitor your usage and apply the products with ease. It also has a delicious, fruity, floral fragrance. With top notes of Egyptian pear, aloe and peach, middle notes of rose, jasmine petals and chamomile and base notes of cashmere, amber, sandalwood musk and coconut milk – the range is a treat for your senses! The collection includes products for everything from fine hair to damaged and coloured, as well as styling products like a great hairspray available in three variations.